Billboard are reporting that fun. frontman Nate Ruess will perform with the legendary British rock group Queen at the MGM Grand Garden Arena in Las Vegas, as part of this year's iHeartRadio Music Festival. "Queen will team up with another powerhouse singer at the iHeartRadio Music Festival this weekend. 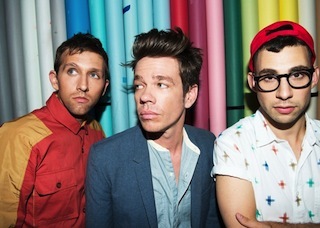 Nate Ruess of Fun. is set to take the stage with the legendary British rock group at the MGM Grand Garden Arena in Las Vegas, a source confirms to Billboard. Ruess and the band -- led by Brian May and Roger Taylor, along with guest frontman Adam Lambert -- were spotted rehearsing "Somebody to Love" and "Fat Bottomed Girls" on Tuesday (Sept. 17), however it's unclear how many songs they'll perform together. Queen and Lambert are on the bill for Friday night, as is Ruess' Fun., whose hits include "We Are Young," "Some Nights" and "Carry On."